Dealing with thinning hair or hair loss? Our topper wiglet hair pieces will give you the natural fullness and volume you are used to. So simple...so beautiful! Featuring the finest synthetic fibers and human hair wiglet hairpieces. 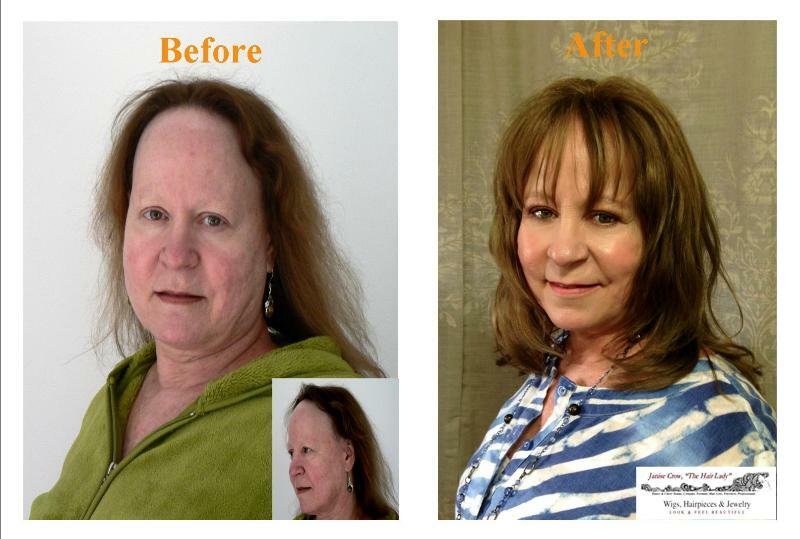 Yvonne wearing Human Hair 17" Monofilament Wiglet in color #12 Sandy went from fine, thin hair to fuller hair with body, and regained her confidence. Meet Yvonne, a 30-something working woman who felt she was "aging well beyond her years" and said she had given up on ever looking good again. Each glance in the mirror was a difficult reminder of her current hair loss and of a future that promised permanent hair loss due to Lichen Plano Polaris (LPP). Wikipedia defines LPP as a form of hair loss which involves scarring, a follicular form of lichen planus, and is considered to have an autoimmune cause. Lichen planopilaris is a distinct variant of cicatricial alopecia, a group of rare disorders which destroy the hair follicle, replace it with scar tissue, and cause permanent hair loss. Yvonne said "I felt resigned to going bald, but decided to go out fighting by making an appointment with The Hair Lady to check out my options. I was not sure what to expect, and did not know it was going to end up being a great day! I could not stop smiling! I was seeing a New Me, but actually, the old me -- but better." How did The Hair Lady do it? 1. The Hair Lady listened to Yvonne's concerns, what she wanted to improve, and suggested a hair system that would meet her immediate and longer-term needs. 2. The Hair Lady outfitted Yvonne with a hand-tied, human hair wiglet (click here to see the wiglet), color matched to her hair that clipped or bonded and blended with her current hairstyle. The wiglet was cut and styled to frame Yvonne's face with wispy bangs. 3. Yvonne received personal hands-on instruction on how to apply makeup to smooth her skin, bring out her eyes and give her the appearance of eyebrows and eyelashes. 4. Yvonne's results are lovely, and she now feels beautiful and confident again. "My co-workers all love the hairpieces and the way it is styled to frame my face," said Yvonne. "They commented on how it looks so real, looks good on me, and matches my hair perfectly. I would definitely recommend The Hair Lady to family and friends." I have many other topper wiglets available that are not shown on my website. Please contact me with your hair needs, and I will be happy to discuss the options available for you. In-salon and Skype or Facetime, consults are available. Fees apply. Do you have thin hair or hair loss on top (crown area)? Don't worry! We have just the thing for you: It's called a wiglet. Wiglets are simply the crown part of a wig, and are attached with clips, tape, or bobby pins. The hair from the wiglet sits over your hair and blends right in. They are available in an array of lengths, colors, and textures, from curls to straight. Monofilament, machine-made (with a teased base), human hair and synthetic wiglets offer something for everyone's budget. Do you have thinning hair on top, or maybe even a wider area and/or thinning in certain places on your head? I would suggest a custom-made wiglet or perhaps a full wig for you depending on your needs and lifestyle. A custom wiglet can easily be made for you, just think of it as a partial wig. This option gives you a wide selection of styles, colors, and hair and cap styles. Do you want more hair for an updo? Now you know the celebrity secrets to beautiful hair. You have lots of options. There are a few variables that would refine your selection: hair length, how much hair, what type of attachment, (if any), texture (curls/straight), color, and human or synthetic fibers. With this information, I can help you select the right hairpiece for your needs.